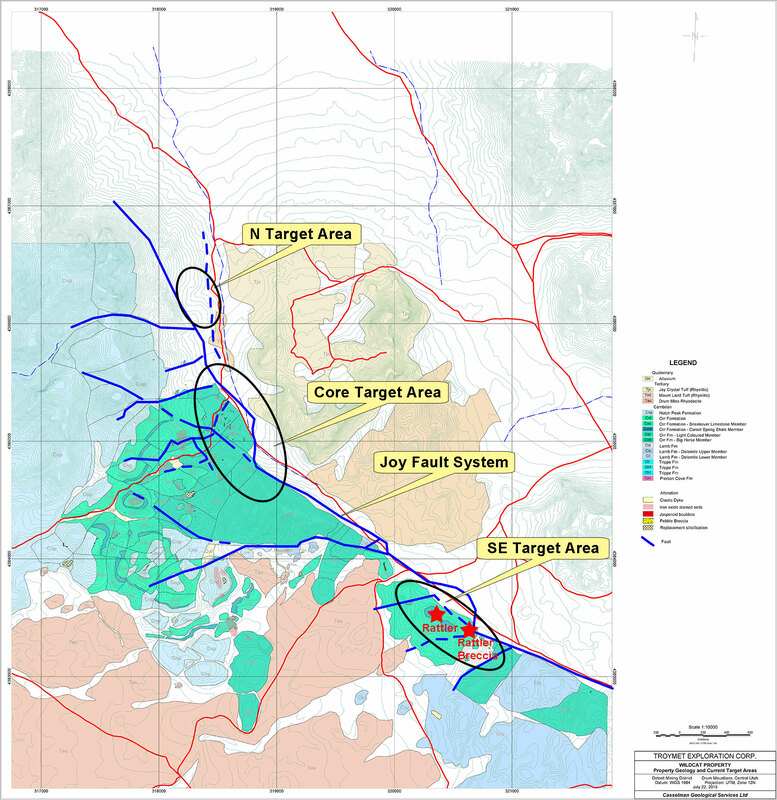 Troymet Identifies New Drill Target… | Troymet Exploration Corp.
December 8, 2015 - Troymet Exploration Corp. (TSXV: TYE) (“Troymet” or the “Company”) is pleased to report that it has identified additional drill targets on its Wildcat gold-silver project in Utah. The new target (“Rattler”) is located ~400 metres northwest of the Rattler Breccia (see Location Map). The Rattler and Rattler Breccia targets appear to be parts of a larger zone and both lie within the Southeast (SE) target area adjacent to a large recessive zone along the margin of the Thomas Caldera. The Rattler anomaly is developed in carbonate rocks immediately adjacent to the Joy Fault in contrast to the Rattler Breccia which is developed in a structurally complex location on the Joy Fault. There is potential for gold and silver mineralization in veins, stockworks, breccias and bulk-tonnage deposits in structural/stratigraphic hosts in Cambrian carbonate rocks in both areas. Neither target has been previously drilled. The Rattler comprises a 300 metre long soil anomaly parallel to the Joy Fault averaging approximately 0.3 ppm tellurium, with mercury and gold concentrations of up to 4.9 ppm and 0.122 ppm, respectively (news release dated July 27, 2015). The target contains strong pathfinder element anomalies and is interpreted to be “leakage” from mineralization in more favourable host rocks at depth (<100 metres) or from mineralization in hydrothermal breccias associated with the Joy Fault. Jasperoid is scarce at the Rattler; however, rounded clasts of probable Prospect Mountain Quartzite similar to those found in the Rattler Breccia, and indicating significant hydrothermal transport (>300 metres), have been identified. This strongly suggests that hydrothermal breccias similar to the Rattler Breccia likely occur in the area and have not yet been identified. Detailed geological and structural mapping, prospecting, hand trenching and detailed bi-directional ground magnetic and EM surveys have identified bedrock sources for the Rattler anomaly in carbonate beds of the Light-colored member of the Cambrian Orr Formation in the footwall of the Joy Fault.Specific sources of the soil anomalies are decalcified and variably iron-oxide-mineralized limestone beds.Tellurium (Te) concentrations in ten samples (Table 1) range from 0.17 to 272 ppm (median 0.71 ppm) and mercury (Hg) from 0.07 to 32 ppm (median 2.8 ppm).Other anomalous elements include gold (Au) (peak value 0.135 ppm) and antimony (Sb) (up to 71 ppm) and arsenic (As) (up to 247ppm). Sulphur values are also elevated suggesting the likely presence of primary sulphides. These rocks are not silicified or obviously brecciated. Mineralization is considered to have been introduced via hydrothermal fluids preferentially flowing along sub-horizontal, permeable beds of the Light-colored member.Silty, sandy units of the Big Horse member, which stratigraphically underlies the Light-coloured member, are the most favourable host rocks for gold mineralization. Based on geological and structural mapping these units are projected to occur at shallow depths (<100 meters). The presence of Au and Te in the mineralization indicates similarities with the mineralization on High Grade hill in the Core target area approximately 2,300 metres to the northwest (news release dated November 17, 2015). Troymet’s rock and soil samples are analyzed by ALS Global in Reno, Nevada, an ISO/IEC 17025:2005 accredited facility. Troymet has granted 600,000 options to purchase common shares of Troymet to directors and officers of Troymet in accordance with Troymet’s stock option plan. All of the options have an exercise price of $0.05 per share, vest immediately and expire 10 years from the date of issuance. Troymet has determined that exemptions from the various requirements of the TSX Venture Exchange Policy 5.9 and Multilateral Instrument 61-101 are available for the issuance of the options to the directors and officers of Troymet (Formal Valuation - Issuer Not Listed on Specified Markets; Minority Approval - Fair Market Value Not More Than 25% of Market Capitalization). This news release may contain certain forward-looking information.All statements included herein, other than statements of historical fact, are forward-looking information and such information involves various risks and uncertainties.In particular, this news release contains forward-looking information in respect of: the Wildcat Project, including the exploration potential and analogous deposit potential of the Wildcat Project; future data analysis, sampling plans and exploration plans on the Wildcat Project; and exploration targets and the potential of such exploration targets.There can be no assurance that such information will prove to be accurate, and actual results and future events could differ materially from those anticipated in such information. This forward-looking information reflects Troymet’s current beliefs and is based on information currently available to Troymet and on assumptions Troymet believes are reasonable.These assumptions include, but are not limited to: the current share price of Troymet’s common shares and the ability to raise future equity financing, if needed, at prices acceptable to Troymet; Troymet’s current and initial understanding and analysis of the Wildcat Project; the ability of Troymet to discover viable exploration targets and the results of exploration on the Wildcat Project; Troymet’s general and administrative costs remaining constant; and the market acceptance of Troymet’s business strategy.Forward-looking information is subject to known and unknown risks, uncertainties and other factors which may cause the actual results, level of activity, performance or achievements of Troymet to be materially different from those expressed or implied by such forward-looking information.Such risks and other factors may include, but are not limited to: the early stage development of Troymet and its projects, and in particular, the Wildcat Project; general business, economic, competitive, political and social uncertainties; capital market conditions and market prices for securities, junior market securities and mining exploration company securities; commodity prices; the actual results of current exploration and development or operational activities; competition; changes in project parameters as plans continue to be refined; accidents and other risks inherent in the mining industry; lack of insurance; delay or failure to receive board or regulatory approvals; changes in legislation, including environmental legislation, affecting Troymet; timing and availability of external financing on acceptable terms; conclusions of economic evaluations; and lack of qualified, skilled labour or loss of key individuals.A description of other assumptions used to develop such forward-looking information and a description of other risk factors that may cause actual results to differ materially from forward-looking information can be found in Troymet’s disclosure documents on the SEDAR website at www.sedar.com. Troymet does not undertake to update any forward-looking information except in accordance with applicable securities laws.